In my Cobra 75 WXST CB Radio review I will cover the features of this reliable radio. The miniaturized device is very small and everything is available to use on the handset. You can hang it from your mirror or from the mic holder and it takes very little real estate in the passenger compartment. This makes it very easy to adjust it while driving. Installing the radio is easy and fast, only requiring the antenna and couple of tools. At four watts or less, this radio model is limited to low-power broadcasting. However, it provides you with enough range and the required power. The form factor and the compact size of this radio are among the things that make it to stand out amount its competitors. The handheld design of the 75WXST unit integrates all the necessary buttons a user might need such as memory, scan, volume control, etc. Its ergonomic curve is designed to fit the hand. Another best feature of the Cobra 74 CB radio is its set of controls. They are highly appreciated by its users. You can count that he unit won’t resent by accident, thanks to the lock control. The CB radio comes also with Scan and Dual Scan in order to constantly provide the user two channels to switch between. Another useful option in the radio is called “Last 3 Channels”. This features allows you to look at the last three channels accessed and, in case that you need it, to go back to any of them. The Cobra 75WXST also comes with a great audio system. It can be plugged into external speakers in case that you need more volume or it can just be used as a PA system. On the unit’s side, you can find the volume control. 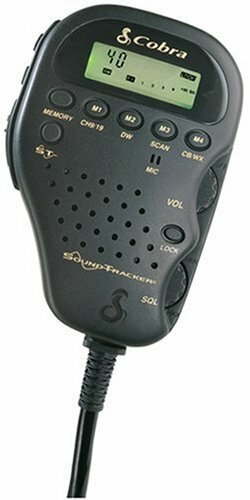 Another great feature of the Cobra CB radio is its SoundTracker System. This feature is designed with the purpose of minimizing the background noise so that the unit’s sound comes out more understandable and cleaner. The 75 WXST radio also offers mounting brackets. With a good antenna, the unit is able to reach up to 11 miles. I did not find many problems with this reliable radio. The only issue I can think of is that it would be good if the internal speaker would provide some better sound quality. I hope that this Cobra 75 WXST CB Radio can help all the beginner users of a CB radio. This model is simple, basic, and easy to use. The unit does not come with any major thrills but is reliable and you can count on it to do a good job. If while traveling a long road you need for a simple CB radio to keep you updated on emergencies and weather, then this small design CB radio can very well suit your needs. This pretty solid unit is easy to control especially when driving, due to its handheld feature. Most of its users appreciate this small yet inclusive CB radio. How do you make it into a PA system, the audio connection is for the speaker and it is a receive outlet. How do you make it change into a transmit mode for a PA speaker?